Realistic Renders... NOT!! 12 "And we're back in the room!" Good ... Here some of my renders. rendering each time: 2 minutes each. You must have a very good system to render each of those in 2 min. Of course I noticed PP2010 rendered much quicker even on my old 32 bit system (even with advanced lighting effects) than DaStudio3A. ...geez I hate it when I typo something and it ends up quoted. We need a real spell checker on which you can add to the dictionary. I add things to the FF one but it never seems to remember them the next time I sign on. 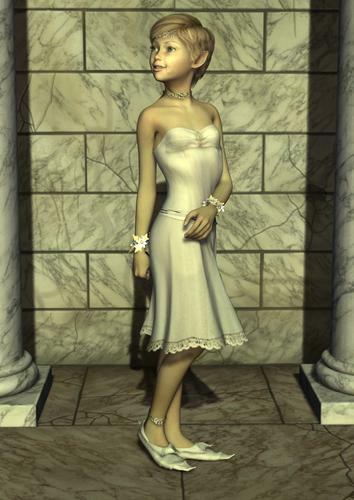 can increase the rendering time of an hour or so in Daz Studio. There are some exceptions and I try to find them. Caribbean Queen Hair is one of them. ...yeah, the transmaps are a killer when using 3Delight with raytracing. I've used Firefly with both raytracing and AO and the longest render (with April's Osean Hair) was something like 14 minutes. If I used Ray tracing in Daz Studio I'd usually run out of memory (32 Bit) and the render would crash. If you have Ubersurface (3Advanced and 4.5 both have it as a built in plugin), you can selectively turn the raytracing off for the hair. 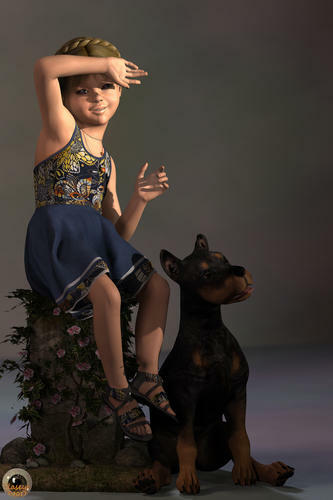 ...Leela's elfin tomboy friend Tracey all dolled up for a very special day. Used my portrait studio light set. Thanks for the tip about Ubersurface for the hair, Kyoto Kid. I will run the tests to see, how it works. these were also rendered in PP2012. Also less than 2 minutes each. The mayor is the pig of frankie nursoda. 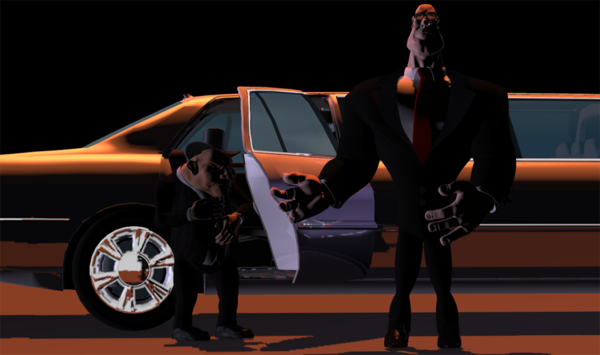 the security agent is an original model for C4D, but "adapted" = (new rigging) for Poser. I was just playing around with the flaming skulls prop in IgnisSerpentus's Azraella set and came up with this. Had an idea i wanted to test out using the previous posts picture. ...nice. love the flaming skull effects on the guns. Another workstation test drop using UE. I can't really can't much credit for the skull effects, that is what teh skull props look like. 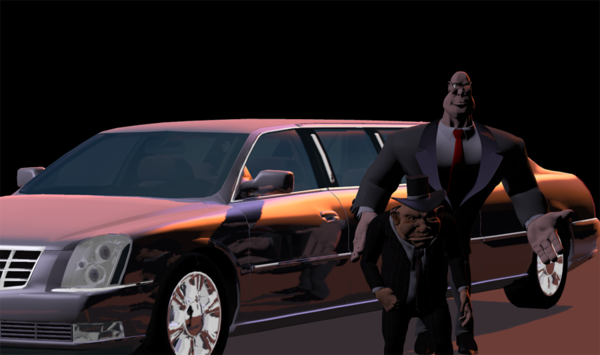 i rendered those in the same scene and didn't touch them with any postwork. they have a ton of morphs too so really as far as teh skulls go i didn't do much. A bit remiss of me not to check my own thread when notifications yet again went AWOL! Anyhow, great renders folks. I'm building stuff to use even though I haven't time to use it. I took full advantage of the March Madness and bought all 3 sets of Lantios core lights. With those and the Interjections stuff I should be able to knock out some nice stuff. Not sure when as I still have 1/6 projects to clear and I need to focus and take my time on those, hand painting requires much more concentration than 3D does I can tell you! I think I'm going to stick with my demon girl Lillyth for a few pictures. No hell fire this time. this was just suppose to be a quick render for myself that i was probably gonna scrap but decided to see what i could do with it instead. It was interesting to work on. I think it may run some stuff smoother. As I mentioned above I purchased a 2 T drive and will be keeping all of my content on it (Backed up to my other 1T drive of course) I may stay with this machine past 2 years if I can re extend the warranty since it does what I need good on ya for the monster system Kyyoto no more "My slow system pukes and chokes" LOL!! Looking forward to R3 for DS later this summer.. I trust you took some of the less family friendly stuff off your hard drive before you took it to be serviced! I really like Windows 8, I use Classic Shell to bypass the Metro screen and it runs like a dream. The only AV I use is what W8 comes with, it takes hardly any memory up and is bloatware free. DS likes W8 too. Personally, I wouldn't extend the warranty as, once it's run out, you can do away with all the manufacturer bloatware. My system is a load faster since I did that. Thats fantastic news! Alot of stuff runs so laggy including DS I read elsewhere that DS runs much better with it too. I think Lux works about the same. A guy at work is doing the upgrade he will most likely get rid of the bloatware. I need the service plan due to the fact I am not running a monster tower with cross air industrial fans.. I am going to have a recovery of the win 8 install.. I use a cooler platform with mine, it's a Coolermaster Notepal U Stand and it does make a lot of difference. It also has several useful USB ports. Under the power settings, there's a way to change the laptop cooling from active to passive, it doesn't run as hot when you do that. It runs up during any renders I do, but not as much as it used to.